Heroes in Crisis #1 Review – AiPT! A sanctuary where fears and lies can melt away seems only to bring more in this weighty first issue. 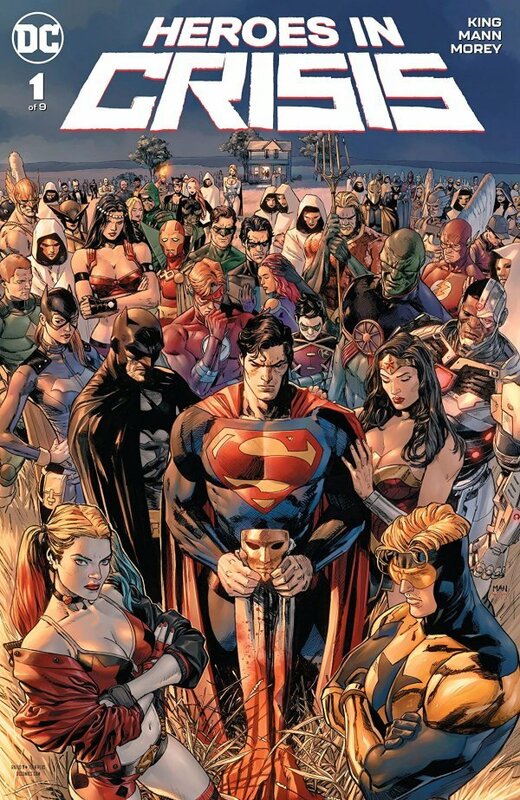 Heroes in Crisis #1 opens in the midst of tragedy. Superman, Batman, and Wonder Woman rush to a place called Sanctuary where heroes were meant to heal from the traumas they’ve endured. Meanwhile, Booster Gold and Harley Quinn have a violent brawl in a rural diner. Is this debut issue just what the doctor ordered? Writer Tom King scripts this issue like the first episode of a prestige television show. Cutting back and forth between Harley and Booster’s fight, the Leaguers, and the patient interviews shown in King’s beloved nine-panel grid gives the issue a steady pace that doesn’t let you rush through the pages even with panels as large as the art team employ. In regular Tom King fashion, the dialogue is kept brief with King choosing his words carefully to convey more with less while also poking fun at the characters and their well-known traits. The pacing and tone maintain a grim, tense feeling throughout that makes King’s sparse dialogue feel all the weightier and shows how much Booster and Harley have gone through even as Harley cracks wise the entire time. Everything is being withheld in this issue, but seeing the aftermath only makes the mystery of what happened all the more tantalizing. Harley Quinn is a difficult character to write well and one who–depending on the tone and intended audience of the book–requires a careful balance of humor and relatability that differentiates her from tropey Manic Pixie Clown Girls. I think King strikes the balance well here with Harley never feeling like she’s too out of her mind and the moments where she shows real pathos feel real. When it comes to Harley’s jokes or zanier lines, even if the jokes all made sense, not all of them landed. There’s a repeated nursey rhyme bit King writes for her and some punchlines were much better than others while the rest felt a bit forced. However, I’d rather King continue to lean more into pathos with Harley rather than make her unrelatable by escalating the humor too much. Clay Mann’s pencils and inks and Tomeu Morey’s colors make for a gorgeous first issue. Mann’s line art is thoroughly detailed, but the pages never feel cluttered with lines. No matter the expression, Mann conveys a range of emotions, knowing just how wide to stretch a grin or how deeply to furrow a brow. A lot of the panels throughout the issue run on the larger side, but rather than speed up the pace of the issue, the panels are loaded in rich details, from shaving cream clouds towering over fields of grass to stray strands of hair tousled in a fight. Morey’s sense of lighting gives the panels incredible depth and makes some of the wider panels look like paintings that could stand on their own. There’s a panel in which dark, thick blood spills out into a pond and Morey’s watercolor-like use of red paired with Mann’s thick inking makes the bloodshed look almost like a photograph. Though Mann’s line art and Morey’s colors result in panels rendered with such depth and detail they could be blown up as cover art, there are moments where Mann and Morey convey the most emotion using the least amount of detail, particularly through Mann’s inking. One of the strongest panels in the issue has Clark kneeling in a field of tall, daffodil yellow grass. Though his caped shoulders are well lit, his face is shrouded in ink as he looks up from the corpse of a young man. The reader can’t see Clark’s face at all, but that shadowed visage on the usually bright, sunlit Kryptonian conveys a lot of gravitas. Clayton Cowles’s lettering only adds to that feeling, with explosive sound effects colored in blue and gold as Booster takes off into the sky and word balloons whose outlines tremble with the exhaustion of the speaking characters. The weakest page of the issue is the most exposition heavy, where a character essentially gives the reader and info-dump of everything the reader needs to know about the series’ premise. What makes this page the weakest is though it helps characterize a major player in the issue, the information they provide feels more like a recap of everything that was already hinted at through King’s usually brief, but carefully chosen dialogue. I didn’t really learn anything from this page and the issue as a whole would feel more impactful if King trusted the reader to piece together what was going on by themselves. Overall, Heroes in Crisis #1 gives us an intriguing glimpse into the aftermath of conflict. It will remain to be seen if the build up from the story’s actual beginning will make this issue feel retroactively earned within the framework of the complete series. However, as a standalone chapter, this is a gorgeously rendered debut that suggests an affecting, carefully handled tale to come. This debut carries the weight of the heroes seeking help within its pages. It’s a good thing every page is a stunner as each member of the creative team brings their best. The pacing and tone lay the tension on thick and give the issue a feeling similar to prestige television. King maintains a healthy balance of humor and pathos with Harley Quinn. Mann’s line art is packed with detail, filling large panels with tons to look at. Morey’s coloring is almost painterly in his manipulation of light and depth. Mann and Morey manage to convey a lot of emotional weight even when they use less detail and let inky shadows do the talking. Clayton Cowles’s lettering is loaded with personality. Not all of Harley’s jokes land with a few sounding a bit forced to keep with established schtick. There’s an information dump that feels unnecessary, especially with how much King shows without telling throughout the issue.